NOTE: This post is from an e-mail I sent out to our Praise Team, to help them get used to additional features of Planning Center Online. For those of you interested, here is a little “quick-start guide” to the features of Planning Center Online that our team is using more frequently, so that you can find your way around more easily. At http://planningcenteronline.com, you can log in with your e-mail address and password. As referenced in the previous post, once you’re logged in you can click your name in the far upper-right of the screen to go to your personal settings screen. There you can change your password to whatever you want, if you’d like. I highly recommend activating text messaging for your mobile phone if you haven’t already (and if you have a texting plan for your cell phone, of course). When you log in (whether or not you are scheduled for the upcoming week) you will see “Upcoming Plans” on the center-right. You can click the date and that takes you to the “Plan”. This is where the fun stuff happens! Also, one of the most courteous things your can do for the team is stay on top of your block-out dates on the left so whoever plans the services will know not to schedule you for weeks where you can’t make the rehearsals and events. There are three primary things you’ll find helpful here. 1) The far left column shows who is scheduled for that week. Not sure if you’re on-deck or not? Check that column and you’ll see everyone’s name. If you don’t see all the positions (audio, camera, video switcher, acoustic guitar, bass guitar, drums, etc. ), then chances are that “group” is minimized. To expand it, look for the little blue circle with the triangle inside. Clicking that will expand or minimize that group so you can see everyone in it. 2) In the main area, you’ll see songs and other “items” in the service, and next to each one, you’ll see that same blue circle arrow. Want to get the chord chart and/or audio file for a song? Simple! Just click the arrow ( ) to expand that song (it will then look like this: ). Directly below the song title is more info about the arrangement, the key, who’s leading, and the song map/sequence, and on the FAR RIGHT of the screen are the attachments. There you’ll see mp3s, pdfs, or other links. If you put your mouse over an mp3 link, you’ll see a little blue circle with a speaker icon. Click the icon to open the music player, or click the title of the song (NOT the speaker icon) to download the mp3. You can also right-click on the song title and choose “save link as” or something similar to save it to your computer. 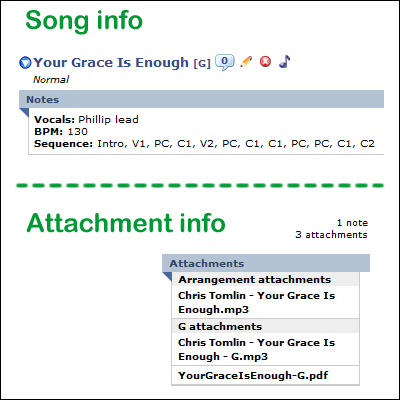 The same principles apply to the PDF chord charts. 3) Want to get ALL the chord charts, and/or listen to all the songs? Simple! Look in the white area in the upper-right section of the screen and you’ll see some links. Put your mouse over “rehearse” and you can open the “media player” or “download all pdfs”. I’ll let you figure out what those links do 🙂 You can also “print this plan” if you want an overview of the whole service. There are lots of little options available to customize the things you print, and I’d encourage you to feel free to click around a little and see what things do. Don’t worry, you won’t break anything. One of the best things you can do to prepare for rehearsals is… prepare for rehearsals 🙂 Even if you think you know the songs, I find that listening to them again still helps, even if just to be a little more familiar with them coming in to rehearsal. The other great thing about having a resource like this is that when your team is learning new songs, you can maximize your time together in rehearsal if everyone takes time beforehand to learn the songs. Honestly, this has been a HUGE weakness of mine over the years, and for me, this is the year to make a change. Hope that was helpful. Let me know if YOU have any suggestions or tips on working with Planning Center Online, or praise team stuff in general.